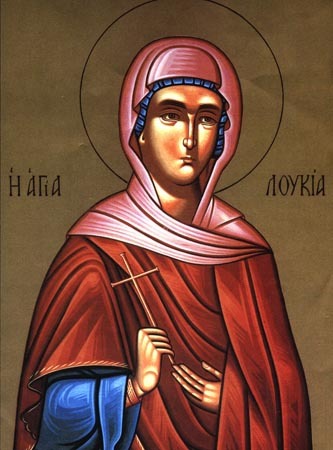 During Diocletian's persecutians, the Christian maiden Lucy went with her mother on pilgrimage to the tomb of St Agatha (February 5), to pray for her mother's healing from an ailment. Saint Agatha appeared to Lucy in a dream and said 'Lucy, my sister, why do you ask from me what your own faith can obtain? Your mother is healed. You will soon be the glory of Syracuse as I am of Catania.' Lucy's mother was healed from that day, and Lucy determined to consecrate herself entirely to God. She broke off an engagement to a nobly-born young man and gave her large dowry of land and jewels to the poor. Her would-be husband angrily denounced her as a Christian to the Governor of Syracuse. At the tribunal, Lucy firmly confessed her faith in Christ and refused to make sacrifice to the gods. The Governor ordered that she be placed in a brothel, but his minions were unable to move her from the place where she stood, even when they tied her with ropes and attempted to drag her with oxen. The Governor asked what witchcraft she used, to which she answered 'I do not use witchcraft — it is the power of God that is with me. Bring ten thousand of your men if you wish; they will not be able to move me unless God wills it.' The men then lit a fire around her, but it did not harm her. Finally they beheaded her where she stood. With her last words, she predicted the deaths of Maximian and Diocletian, and the coming of peace to the Church.